Trevor and I have officially been married for over two years now. I know that I've changed quite a bit in those two years. I think that's supposed to happen, isn't it? Something about marriage helping us to aspire to greater holiness? I know I read somewhere that marriage is a great way to smooth the rough edges in our personalities. I know that's been true for me, anyway. I think the biggest change I recognize in my own life is that I have a much quieter spirit than I once did. I'm less... dramatic. It used to be that I'd hear bad news, or a not-great situation, and I'd get all worked up. My genuine concern about a person or circumstance would get whipped up into drama. 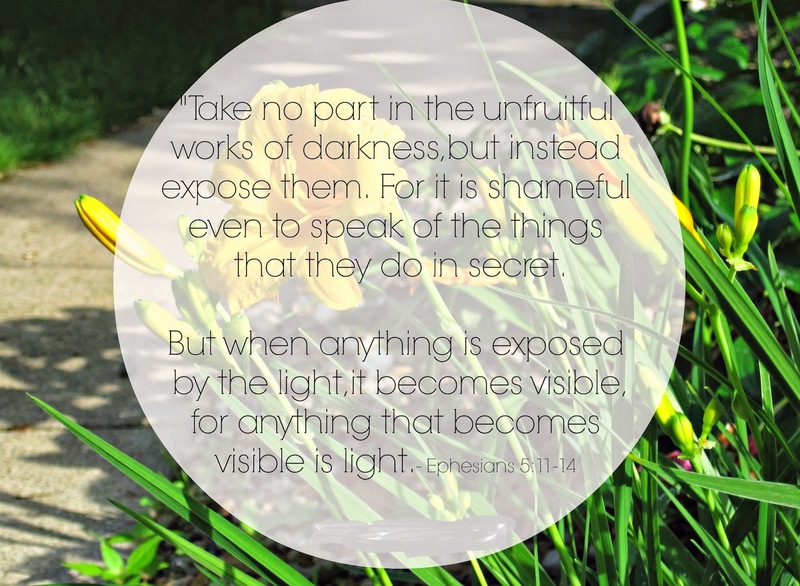 In Ephesians, Paul reminds us that we're not to get involved in unrighteousness, in darkness. Our culture has so much of that darkness. If we're not exposed to people living life in the darkness of sin, then we see it on the news, on billboards, in comments on Facebook. It's all around us. But we're to live differently. Not only are we not supposed to be caught up in that, but even talking about it is shameful. It's one thing to express a concern, to ask for prayer, or to genuinely seek advice. It's another to share information for the drama of it. 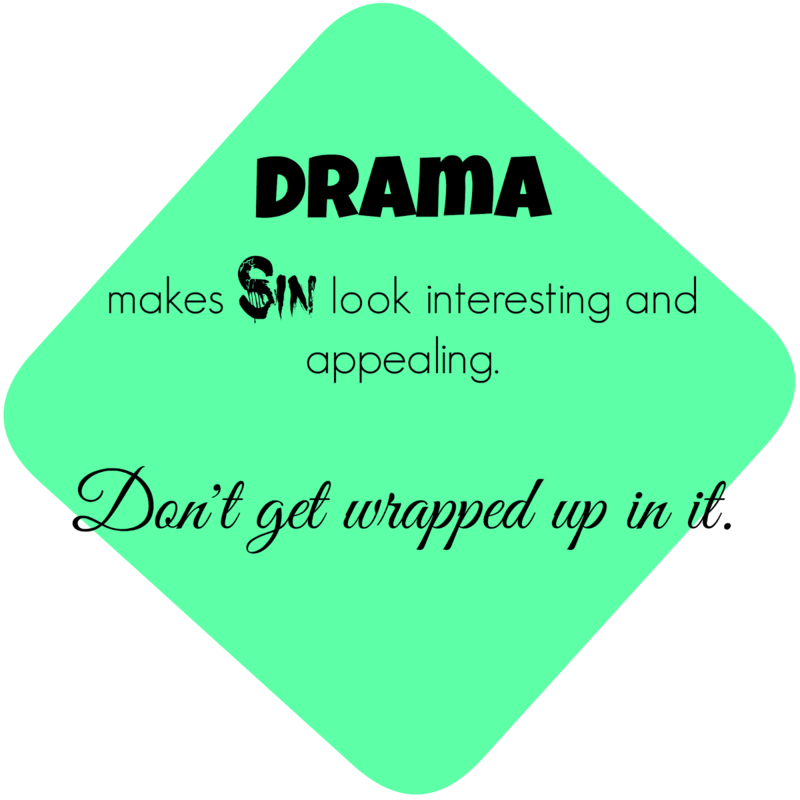 The trouble with drama is that it takes the sins we're concerned about and makes them interesting and appealing. And then we start to seek the drama, not realizing that the things that are most flashy and exciting are often the things that pull us away from God and toward sin. I think that may be one of the biggest things I've learned. A life and attitude that are quiet, undramatic, simple... it may not look very exciting from the outside. But I'm not trying to impress people, anyway. I'm living an obedient life, trusting that God knows what's best for me (whether it's missions a world away, or serving my community, or even just touching the life of one person), and fixing my eyes on Him- living abundantly and joyfully. That's more than enough for me. And drama? It just gets in the way.